How important is diamond cut? For most people, diamond cut is more important than the color, clarity, and carat size when selecting a diamond. The cost between a Signature Ideal cut and a poor cut, can mean up to a 47% difference in value. For engagement rings, we recommend the main diamond be at least a very good cut or better. Our signature cuts which are diamonds that are chosen for specific proportions will ensure you are choosing a well cut diamond when a cut grade is not available on a certificate. This is often the case for diamond shapes other than round diamond. “Diamond Cut” can have two meanings as it relates to a diamond. It can mean the shape the diamond is cut to, for example a princess cut (square cut), or, it can mean the quality of cut of a diamond. We will be referring to the quality of cut. More of the rough diamond is wasted in obtaining a well-cut diamond. It takes a great deal of knowledge, expertise, and experience to be a great cutter. Few cutters in the world can create an Ideal Cut. Less than 3% of diamonds achieve an Ideal Cut, thus making them very rare. Many people agree an Ideal Cut/Very good cut is the most sought after aspect of a diamond, making it a characteristic in high demand when searching for a diamond. A round diamond cut to precise proportions and symmetry can show a “Hearts and Arrows” pattern when viewed with a proportion scope. These diamonds arguably give the most “fire” and “brilliance” than any other. Essentially, the better the cut the more brilliance and scintillation (sparkle and fire) a diamond will have. If a diamond’s depth or diameter is greater than it should be, light will escape through the pavilion and not be reflected back to the observer’s eyes. The same holds true if a diamond’s diameter is less then it should be (which is common for larger diamonds in many chain stores). This is simply done to obtain a heavier weight–the quality of cut is sacrificed to obtain a larger carat size. However, bigger is not always better. Most people will choose to sacrifice weight to get a very good/ideal cut diamond when they have a chance to compare. As you can see below, if the diamonds are cut too shallow or deep, light will enter through the top and escape out the bottom. Polish and symmetry are two important factors in determining the cut. These two characteristics are easily viewed on reputable gem lab certificates. “Polish” refers to the smoothness of the diamond facets. With poor polish, the diamond may appear dulled or cloudy-like. “Symmetry” refers to the alignment of facets. If the symmetry is poor, light will be misdirected when it enters and exits the diamond. See symmetry illustration below. Below is a diagram that refers to the different parts of a diamond. Another key factor in choosing a well-cut stone are the existing proportions of the diamond. In 2006, GIA introduced the cut grade on their reports for round diamonds. Although the Gemological Institute of America (GIA) maintains their theology that an ideal cut does not exist, GIA has noticed that here are a number of different combinations off angles and facet length that appear to bring forth a lot of sparkle and fire. GIA grades cut as follows, Excellent, Very Good, Good, Fair, Poor. Please note that the information listed below will narrow down what to look for in terms of proportions, but it is only for your information. It is best to see the diamond for yourself and compare. The American Gem Society (AGS) also has a cut grade where the term Ideal Cut is often used where GIA may use the term Excellent Cut. Below is a picture of a diamond and a graph showing some key information on what to look for when identifying desirable proportions. Below is a graph which gives an indication how the cut grade may effect the price of the diamond with the color, clarity and carat weight all being the same. 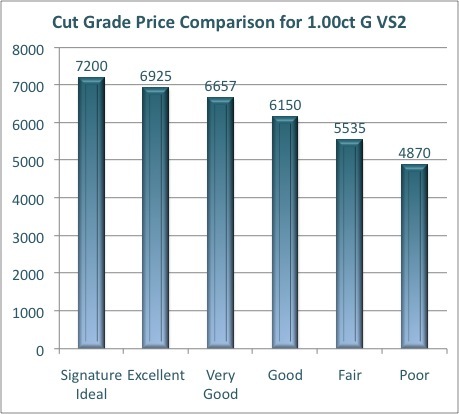 As you can see the cut grade can vary the price of a diamond by up to 47% from the highest cut grade to the lowest. This is why it is important when comparing pricing to consider all aspects of a diamond.